Three of jump racing's biggest stars have been lined up for a clash at the Punchestown Festival later this month. Cheltenham Gold Cup winner Don Cossack is set to renew his rivalry with Cue Card, a late faller in last month's race and a subsequent Aintree winner. They are expected to be joined by Vautour in the Punchestown Gold Cup on 27 April. Vautour was switched from the Cheltenham Gold Cup three days before the race, and won the Ryanair Chase. 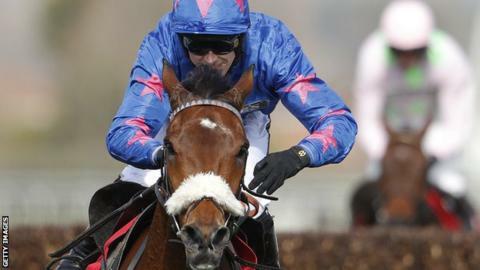 "The plan always was to go on to Punchestown and I don't see any reason to change that," said Cue Card's trainer Colin Tizzard. "Hopefully they both jump a clear round. Don Cossack's fallen once, we have fallen once and hopefully they both jump clear and we will see who finishes in front."